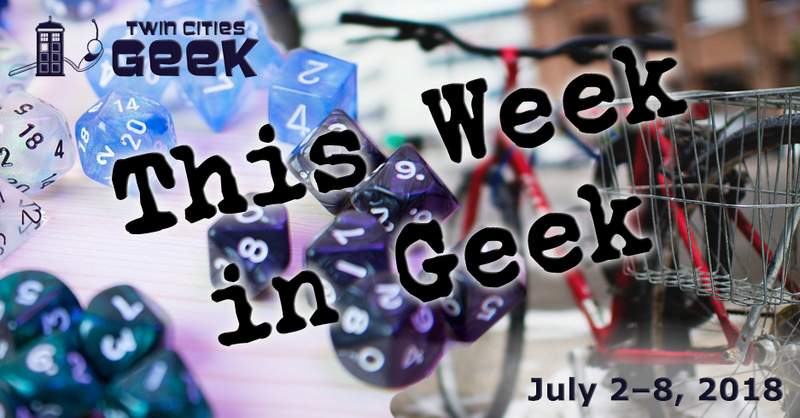 Welcome to This Week in Geek, your guide to events of interest to the Minnesota geek community for the week of Monday, July 2nd to Sunday, July 8th. When: Monday, July 2nd at 6:30 p.m. When: Monday, July 2nd and Tuesday July 3rd at 7:00 p.m. and 9:15 p.m. When: Tuesday, July 3rd at 7:00 p.m. Enjoy a night of community and tea with Tea and Meeples, a weekly gathering of friendly geeks at Panda Castle in Richfield. This week, the group will get together for a night of board games and enjoy a dinner of spaghetti. When: Tuesday, July 3rd at 7:30 p.m.
Come and experience YogaQuest, a blend of yoga and fanfiction storytelling led by certified yoga instructors. Experience a yoga workout experience and a story at the same time. The theme for this week is Parks and Rec, so fill yourself with civic pride. This event costs $15. When: Wednesday, July 4th at 10:00 a.m. Celebrate the birthday of this nation with a variety of ceremonies, military parades, and learning opportunities. There are activities throughout the day, including fife lessons, mock battles, and chances to learn about the struggles for freedom of all Americans, including enslaved peoples, Native Americans, and women. Tickets are $6-12. When: Thursday, July 5th at 12:00 p.m. to Sunday, July 8th at 7:00 p.m.
CONvergence is an annual four-day convention for fans of sci fi and fantasy of all kinds. The event has a different theme every year, and this year’s theme is “Natural Twenty,” and celebrates the 20-year critical hit that CONvergence has been for the geek community. In addition to panels, cosplay, room parties, and many new guests and returning fan favorites, we’ll be there as well! Twin Cities Geek will have a fan table set up outside Mainstage, and Twin Cities Geek/Fearless Comedy Productions badge backers are back for 2018 and can be picked up at registration or the fan table for free while they last. You can also check out the TCG Twitter feed all weekend for tweets and updates on panels featuring Twin Cities Geek contributors. There’re a wide variety of ways to get involved with this event, so check out the event’s website to see where you fit in! When: Thursday, July 5th at 7:00 p.m.
Lego Building Night is a monthly night of Lego building for all ages, but mostly aimed at kids from 5–13. Participants are invited to work on sets, or free build. This is a free event, and the hosts will have Lego pieces available for use by participants! One-Shot Comics, a monthly comic series devoted to covering a diverse range of comics and graphic novels, returns with a discussion of Maggie the Mechanic, the very beginning of the epic comic series Love and Rockets, showing the “earliest, punkiest, most heavily sci-fi stories,” from the series. One-Shot Comics strives toward the goals of “creating an inclusive space” and “perpetual awesomeness.” As usual, you can pick up a copy for 20% off at Moon Palace Books. When: Thursday, July 5th at 8:30 p.m. Enjoy an evening of community and movie magic under the stars! Movies start at dusk and are free and open to the public. Screening this week is Spider-Man: Homecoming, a coming-of-age story from the Marvel Cinematic Universe. Bringing a blanket or lawn chair is recommended, and children under the age of 10 must be accompanied by an adult. When: Friday, July 6th at 6:00 p.m. When: Friday, July 6th at 7:00 p.m. When: Friday July 6th and Saturday, July 7th at 11:30 p.m. The Riverview Theater, a neighborhood theater known for cheap second-run cinema, will be continuing its summer late-night programming series with Crouching Tiger, Hidden Dragon, the visually stunning and award-winning Wuxia epic from Ang Lee. All tickets are $3, and the theater only takes cash. When: Saturday, July 7th at 10:00 a.m. When: Saturday, July 7th at 2:00 p.m. Learn the art and science of Bronze-Age sword making at this informative event in south Minneapolis! There are two parts of this class: one focused on making a wooden blank sword and the other focused on actually casting that sword out of aluminum, and you’ll finish up by wrapping both of these swords in leather for handles. This class costs $85, but the pride of forging your own sword right out of the Bronze Age is priceless. Multiple types of swords are available. When: Sunday, July 8th at 10:00 a.m. When: Sunday, July 8th at 12:00 p.m.